Let joy rain down from above -- it may say Kobra: Resurrection on the cover of this book, but this is actually the unnamed fifth volume of Greg Rucka and Eric Trautmann's Checkmate series. The quality of stories in this volume isn't exactly steady from beginning to end, but overall it's an impressive and creative collection, and DC Collected Editions Group Editor Georg Brewer, Editor Sean Mackiewicz, and the rest of the department should all be proud. 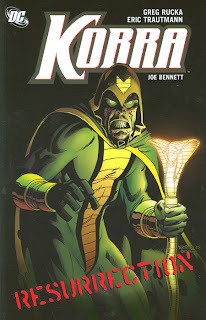 Kobra: Resurrection is essentially the collection of the recent Faces of Evil: Kobra one-shot special (which itself leads in to Trautmann's JSA vs. Kobra series) padded out with filler material. DC has filled out the collections of a couple shorter storylines recently to fair effect (Superman: Back in Action and Escape from Bizarro World are two in recent memory), but Resurrection well illustrates the value of this approach. Not only does Resurrection include two pre-Crisis on Infinite Earths Kobra stories that lead in to the Faces of Evil book (one story drawn, no less, by Jack "The King" Kirby), but also the three-part "Castling" story that concluded Rucka and Trautmann's Checkmate run (#23-25), the only issues that were, until now, criminally uncollected. Whereas Rucka and Trautmann's other last volume of Checkmate, Fall of the Wall, effectively concluded the book's long-running Amanda Waller storyline, "Castling" brings Checkmate full circle from the events of Rucka's The OMAC Project where it all began. Over the course of Checkmate, we've seen the organization recruit a who's who of the DC Universe, including the Outsiders, Shadowpact, the Martian Manhunter, and more, but "Castling" involves the heavy-hitting Justice Society and Justice League -- and most importantly, it's three charter members, Superman, Batman, and Wonder Woman. OMAC Project readers know that if anyone has a reason to distrust Checkmate, it's DC's Big Three, after former Checkmate-head Maxwell Lord nearly killed Batman using a mind-controlled Superman before Wonder Woman killed Lord to free Superman. Superman states from the outset that he doesn't like Checkmate when they deputize him to stop a Kobra plot, and Black Queen Sasha Bordeaux wises rips up the deputation order in favor of asking for help; this first step launches "Castling" as a story about how Checkmate has changed, especially in comparison to the all-too similar Kobra cult. At the end, Sasha faces the choice to kill a deadly nursery of Kobra infants, and instead chooses to raise them under Checkmate jurisdiction; it's a surprisingly bloodless move that's surprising from the often tough-as-nails organization. The writers emphasize (with artist extraordinaire Joe Bennett) Wonder Woman's face when she tells Sasha that she looks forward to working with Checkmate again, and there's no greater compliment the organization can receive given their history. "We have time. Checkmate isn't going anywhere," Sasha says, and it's a wonderfully hopeful message, this reader interprets, from Rucka and Trautmann, that a Checkmate series or mini-series might find it's way to the stands one day. In contrast, then, I found Ivan Brandon's Faces of Evil: Kobra tale at the end of this book less satisfying. In the classic issues here, we meet Kobra leader Jeffrey Burr -- a Siamese twin kidnapped as a child by the Kobra cult -- and his brother Jason, teamed with Batman to try to stop his brother. Jeffrey seemingly kills Jason, but in the Faces of Evil story, Jason apparently returns to life and takes on his brother's role. I say "apparently" because what's going on in the story is not at all clear; far more pages are spent on a bloody shoot-out than explanation Brandon tells the story well, but it's too much of a bridge to JSA vs. Kobra -- the book just ends, rather than concludes, without any answers, and feels unfinished. That said, to be sure Kobra: Resurrection gets an honored place on my shelf. Checkmate was a smart, worldly, political series that fully immersed itself in the DC Universe, and signifies for me much of the good that came out of DC Comics "One Year Later" after Infinite Crisis. If enough of us pick up this book, maybe DC will see fit to reconsider Checkmate and publish another. I'm surprised they didn't put Checkmate's name on the cover - even though it's a collection of Kobra stories, I can't imaging his name's a selling point compared to making it the 5th Checkmate volume. Still, looking forward to picking this up! So glad to finally have the rest of Rucka's Checkmate on the shelf next to it's companions. OK, I didn't realize that my Checkmate trade collection was incomplete. If it wasn't for this review, I'd probably still be an ignorant fool, so... thank you, Collected Editions!